Legendary director Ridley Scott’s filmography has left a lot to be desired, judging by whose opinion you gauge. Since 2001, flicks such as Kingdom of Heaven, The Counselor and Prometheus have drawn negativity from both critics and fans of Scott’s work for varying reasons. So it is somewhat pleasing to reveal that the 77 year old’s latest project, The Martian, is a return to form for the English director. An adaptation of an Andy Weir science fiction novel, The Martian tells the story of Mark Watney, played by Matt Damon, an astronaut who specialises in botany and mechanical engineering, who is part of six person team of the manned Ares-III mission to Mars. During a cataclysmic sand storm at night at the team’s research base on one of Mars’ plains, Acidalia Planitia, Watney is struck by debris and becomes separated from the rest of the crew. Presuming Watney to have been killed by the impact, the remaining members of the team evacuate the planet and begin the arduous, four year space flight back to Earth. Watney, however, survives and begins putting plans into place with one solitary objective in mind: staying alive. Abandoned and with minimal resources available to him, Watney must use all of his ingenuity, expertise and creativity to endure the barren red planet. Naturally, not everything goes according to plan for the astronaut, with a number of mishaps and setbacks along the way pushing Watney to his physical, mental and emotional limit. It is here that Damon, who oozes charisma, dry wit and charm in the titular role, draws upon all of his previous acting experience to express the full range of emotions that the character encounters throughout the 141 minute run time of the feature. Overjoyed at becoming the first man to grow food on Mars (The “In your face, Neil Armstrong” line being delivered drolly by Damon during this scene bringing the biggest laugh from the audience) to the realisation that he may not survive long enough before help arrives, Watney comes full circle time and again as his plight becomes more agonizing with each passing week. Meanwhile, back at NASA Headquarters, Mission Control attempts to find a way to rescue the stricken astronaut after realising that Watney had indeed survived the storm. It is here where Damon is backed up by a stellar, A-list cast who all excel in their respective roles.The list of actors which includes, but is not restricted to, Jessica Chastain, Jeff Daniels, Chiwetel Ejiofor, Kristen Wiig, Sebastian Stan and Sean Bean, who all sparkle as Watney’s fellow astronauts and as part of the NASA team who strive to bring Watney back to Earth. 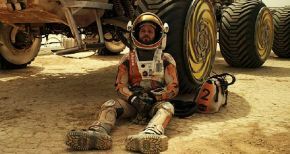 Away from the cast of The Martian, the production value of the film is as impressive as fans of Scott’s previous have come to expect. Scott’s vision and skill behind the camera brings Weir’s novel to life almost effortlessly, with each scene carefully crafted to portray each location (whether it be Mars, NASA or elsewhere) as accurately as possible. In his fourth collaboration with Scott, composer Harry Gregson-Williams delivers an OST that combines an extra-terrestrial sounding score with an amusing selection of 1970s disco playlist that only adds to the comical nuances that Damon portrays as Watney. The comedy takes a back seat as the climax of the film ramps up the tension as an extremely bold move is made in a bid to save Watney, but there is still time for the odd comic line to be thrown in; such is the nature of the characters inhabiting the fictional story. All in all, The Martian is another superb addition to the growing list of brilliantly produced Scott films, with its balance of humour, drama and ambition showcasing that the director still has what it takes to pull a blockbuster motion picture out of the bag, and it would not be surprising to see The Martian land a few nominations come Oscar season.